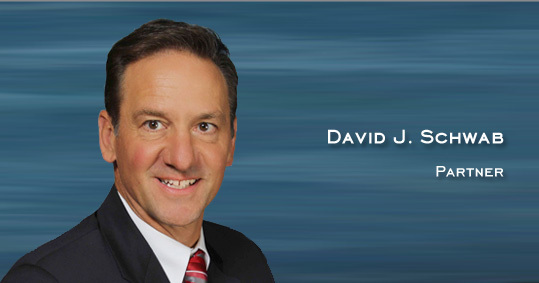 Since 1990, David J. Schwab has developed a law practice with a focus in bankruptcy and creditor/debtor rights, business planning and restructuring, and commercial litigation. He and his law firm, Ralph, Schwab & Schiever, Chtd., are recognized by Martindale Hubbell’s Bar of Preeminent Lawyers in the areas of Bankruptcy Law, Business Law, and Commercial Litigation. As a trained CPA and practicing attorney, Mr. Schwab is uniquely qualified to assist financially troubled companies, analyze their legal options, and assist them toward a successful resolution of their legal/financial issues. Mr. Schwab received his law degree from the DePaul University College of Law. While in law school, he was an executive editor of the DePaul Business Law Journal. He also served as an “extern” for the Hon. Robert E. Ginsberg, United States Bankruptcy Judge. In that position he researched the law and drafted legal opinions for cases being heard by Judge Ginsberg. Prior to law school, Mr. Schwab worked as a business consultant for Coopers & Lybrand (now PriceWaterhouseCoopers). He obtained his undergraduate degree in accounting from Indiana University. Recognized by his peers as an experienced lawyer in bankruptcy and financial workouts, Mr. Schwab has served as a lecturer for the Lake County Bar Association (Bankruptcy Committee), the Association of Illinois Attorney-Certified Public Accountants, the Milwaukee County Bar Association and the Federal Reserve Bank of Chicago. He is a co-author of “Assignment of Rents in Bankruptcy” for the Commercial Law League of America (Seminar in Advanced Bankruptcy Practice). Mr. Schwab has served as past President of Illinois Association of Illinois Attorney-Certified Public Accountants, a member of the Board of Directors of Northwest Community Bank, and has served on the DePaul University College of Law Alumni Board. He is also an active member of the American Bankruptcy Institute and the Chicago Bar Association Bankruptcy Committee.